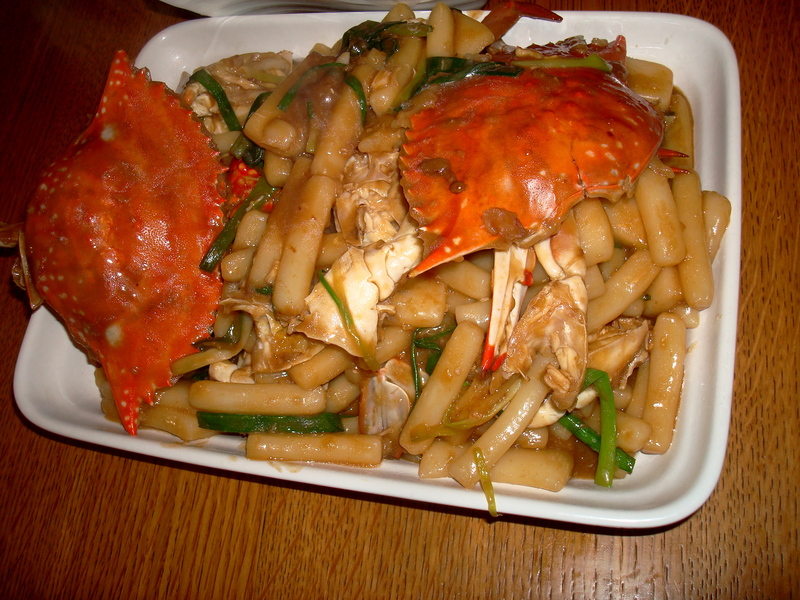 The most memorable dish Chen Leilei made for us, with fresh live crab and their roe. My poor attempt to recreate the dish, with too-small, roeless Maryland blue crab. For more Hangzhou recipes, check out my NPR Kitchen Window column. Cleaning and cutting up live crab is not for the faint of heart. I had no problem watching Hangzhou TV chef Chen Leilei do it when she gave me a cooking lesson back in China in August. But I had more trouble when I tried to recreate the recipe, using too-small Maryland Blue crabs, with my dad in Virginia. 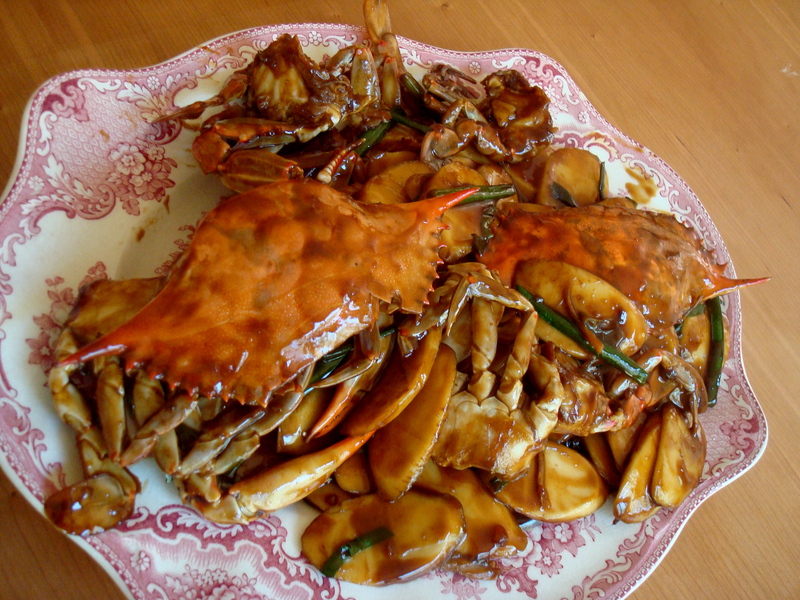 Chen’s Ningbo Crab with Sticky Rice Cakes (nian gao) was about the best thing she prepared for us at her apartment in Hangzhou. 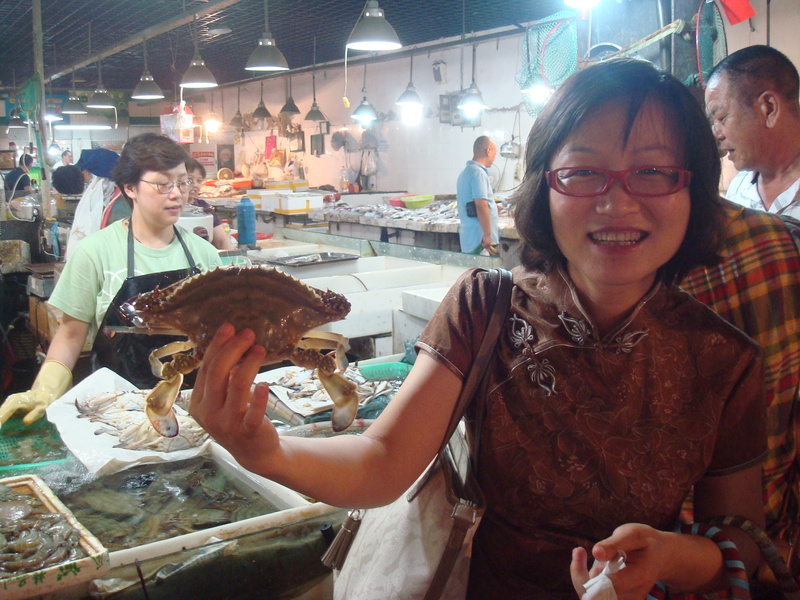 We met her at a local, open-air wet market, where she picked out the still-swimming fresh crabs. At the market, she also bought those pillowy glutinous rice sticks (nian gao) so much fresher than the refrigerated or frozen “rice ovalettes” (known as dduk in Korean) you find at Asian markets here. The finished recipe, from the seaport of Ningbo just east of Hangzhou in Zhejiang Province, had the perfect balance of salty, sweet and umami flavors smoothed out by the presence of the dry sherry-like Shaoxing wine. This ubiquitous cooking wine is central to Hangzhou dishes and shows up in much of Chinese cuisine. Pick some up at your local Asian market and use it to enhance any stir-fry or dipping sauce. What follows is my attempt at translating Chen Leilei’s recipe. 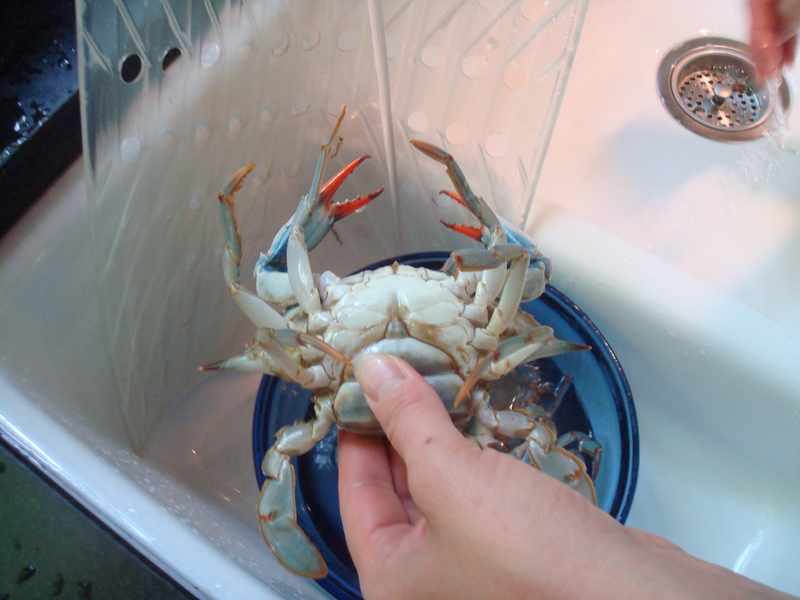 And if you’re squeamish about live crab, try boiling them in salted water for two minutes first before you dismantle them. Just stun them unconscious first (by hitting the head against the cutting board), so they aren’t boiled alive. 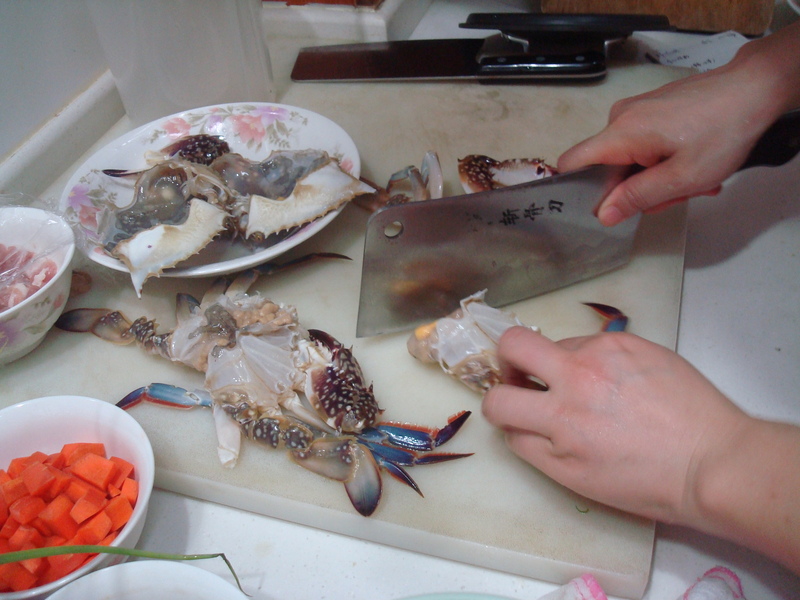 1.Stun the crab, remove aprons and carapace (reserve whole back shells for stir-fry) and clean out guts and lungs. Quarter crab and bash the shell a bit with cleaver so flavor will seep out when it cooks. Dip exposed meat in cornstarch to keep it in the shell and add texture. Separate the rice cakes and soak them briefly in hot water to soften them. Drain them. 2. Heat canola oil in wok. Add slivered ginger and stir-fry a minute, until fragrant. 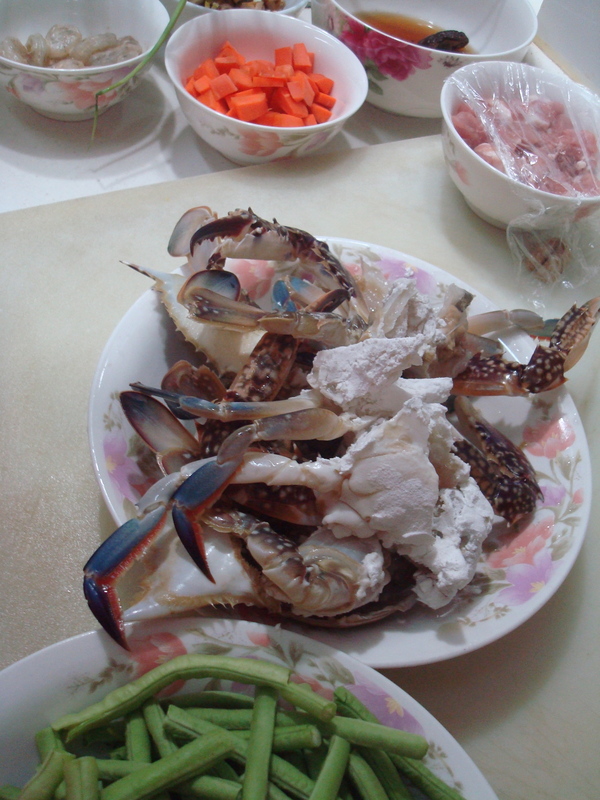 Add crab pieces (including the whole carapaces) and stir-fry about 4 minutes, until the shells turn red. 3. Add the Shaoxing wine, half the scallions, soy sauces, sugar, rice cakes and water. Cover with lid and simmer about 2 minutes, until done. 4.Remove lid and stir in remaining scallions. Plate and serve, with crab crackers if necessary. Chen Leilei picks out the crab. 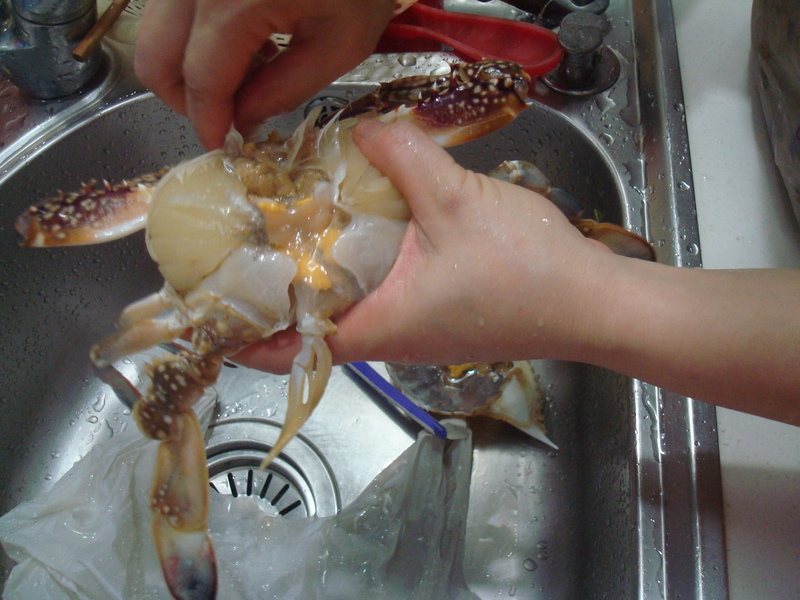 Cleaning the live crab. That orange roe is crucial for flavor. Cutting up the whole crab. Dip the exposed meat in cornstarch before stir-frying. The much smaller live Blue crabs I used from the Asian market. Next time, I’ll try it with larger Dungeness or Red Rock out here in Oregon. These immature crabs had no roe to flavor the dish. Crab roe is really big in Shanghai and Hangzhou cuisine. Hi, I just finished reading your article on NPR about Chinese Hangzhou cuisine. In the first recipe for the tofu soup, you have mis-spelled shiitake. (Sorry, it’s one of my pet peeves!). It’s great to see young people in the kitchen. Your recipes look very interesting, I’m going to try the shrimp. Followed a link on your NPR Kitchen Window column to your blog here. Thank you SO MUCH for doing a column about Hangzhou cuisine! I lived there for 3 years (hoping to go back) and I miss the food so much! No one does amazing communal food like the Chinese. Glad you enjoyed the piece! What were you doing in Hangzhou? I studied at the Friends World China Center at Zhe Da in fall 2000. What were your favorite Hangzhou dishes? During that term, I really enjoyed nan gua bing (gelatinous pumpkin pancakes). Oh love Lanzhou la mian and spicy leng mian. Ate at a good shop on Xue Yuan Lu when we were back. I think you could make my soft tofu soup recipe without meat and just lots of veg. I added cabbage to it the other night. The sesame oil drizzle at the end gives it some flavor. You can buy the fresh long rice sticks at Sunrise Market in Eugene. Best to call ahead, though, to make sure they have them! Sweet, Eugenia! So those must be dduk. I can’t wait to try them. I love the chewy texture. I’ll check out Sunrise when I’m next in Eugene, which is pretty often these days! came across your npr article about hangzhou homestyle cooking after looking high and low for a chinese cookbook myself. super kudos and many thanks for the wonderful recipes. just wanted to pipe in and let you know that the ovalette dduks are usually used for soups (korean rice cake soup for New Years) and the long cylinders are usually served in saucey dishes (i.e. ddukbbokki) the taste is proly marginal, but the ovalettes are also rarely fresh (usually frozen or pre-dried for packagin) anyways. For anyone considering getting female crabs with roe for this recipe, please don’t. Most people in a position to get any (i.e. crabbing license) should know better. But this is an important enough issue that I feel it’s necessary to make sure to get the message through to anyone who might not have that awareness. Crabs in the bay are under a lot of population stresses, and harvests have been in decline for a long time. We need every breeding crab we can get. Female crabs that are carrying eggs should be returned to the water. Possession or transportation of egg-bearing females is illegal in Maryland. And you really shouldn’t keep females at all. Peter…you are so right! I knew something didn’t sound right. Unfortunately, roe, and other unethical delicacies, play a central role in some Chinese dishes. Anything you would recommend substituting for roe? Again, I was not advocating that anyone illegally harvest mature female crabs. I was just ignorant about this. The Maryland females I used were obviously immature. I don’t think you did anything wrong; just assumed you were including that bit in because it was from the original recipe. I just wanted to put a note in for those rare cases. 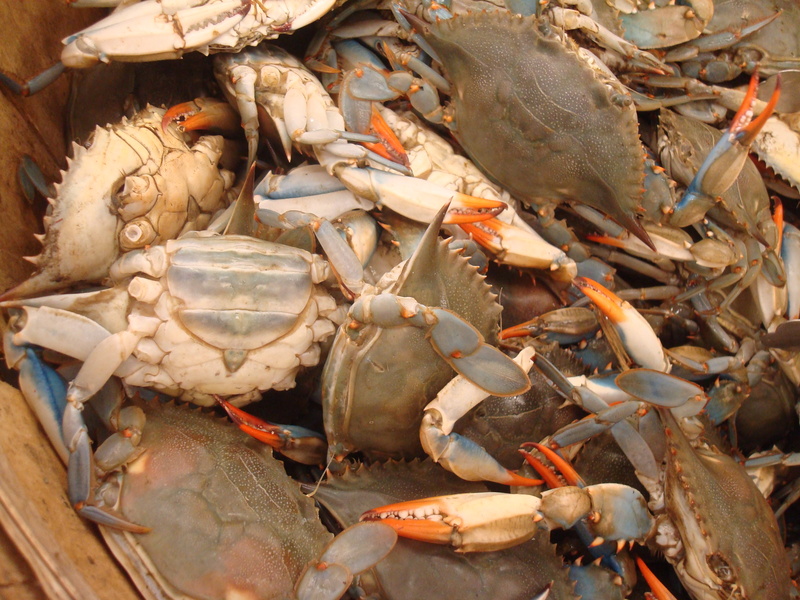 And for others reading this – we are talking specifically about Blue Crabs from the Chesapeake. I’m surprised they’re available for sale commercially – recreational licenses only cover males over a certain size. Unless your local market is buying things under the table, I guess it’s probably ok. I don’t think I’ve ever eaten a female blue crab, actually. Do they taste different, aside from the roe? As for substitutes I have no idea. If you can describe it, I might be able to take a stab at the question. Coincidentally enough, most of my cooking experience is dealing with special diets and doing lots of subbing – I may be able to help out. Also – any notes on the whole stunning technique? I’d never heard of that. I don’t really eat animals anymore myself, but I think it would be a good thing to elaborate on. Everyone I knew always just boiled them alive, which is kind of horrific really. I assume it’s somewhere between “tap it lightly” and “bash it’s brains in and crack the shell”. How do you know what’s enough without being too much? I’ll try to avoid all females in general next time!